I’m not sure how old I was the first time I tried to kill myself. I don’t remember because my life at that point had turned into a blur. It was my early twenties, and I was drinking too much and in a bad relationship. I didn’t have any friends, I was taking psych meds but not being honest about what was going on, to anyone. I often felt like I was peering out at the world from a very deep and far place within myself. I’m not sure when suicide became an option – but I knew early on that it wasn’t supposed to be. It wasn’t a thing normal teenagers or young adults considered, and thinking about it gave me an ache deep in the pit of my stomach. I had an ex-boyfriend who shot himself the summer I turned 17, with a gun I’d watch him purchase from a friend. I knew he hurt in a way that most people didn’t hurt. When I got the news of his death I was slipping so far into a strange web of drugs and late nights and not sleeping that it felt par for the course. His death felt like a lie someone told me, because I was telling myself and other people around me piles of them those days. My suicide attempts were always directly related to changes in my hormones, and drinking too much. I still have faint scars from where I tried to slit my wrists the wrong way. I was horrified afterwards at the fat pink tissue, like footballs, healing up. I sat in ER’s and in psych wards and was incredibly uncomfortable. I always regretted what I’d done afterwards, longed for a shower at home. I wish I could tell you an enlightening story about a conversation I had with people I met while wasting much of my twenties, drunk and high and depressed, but real life isn’t a vignette pulled from a novel. It’s not Girl, Interrupted. Depression is a disease like any other, it just affects your brain chemistry rather than your skin or your lungs or your red blood cells. I felt like I could do anything, or nothing, and the world around me would hang there heavy like thick blankets. Getting groceries was a challenge – why not just drop the bags, walking up the stairs? Why carry them all the way in the house? Every single moment was a small internal battle, totally unplugged from the world around me. We so rarely hear of celebrities plodding through, day-to-day. Making it to therapy appointments, getting prescriptions from their care team, sending their personal assistants running out to Walgreen’s. Small successes don’t make headlines like our losses do. As we mourn Kate Spade and Anthony Bourdain, another two icons gone, it’s important to keep room in that mourning for the stories of others who have made it through depression. Let's not just talk about celebrities with mental health issues when they die by suicide. 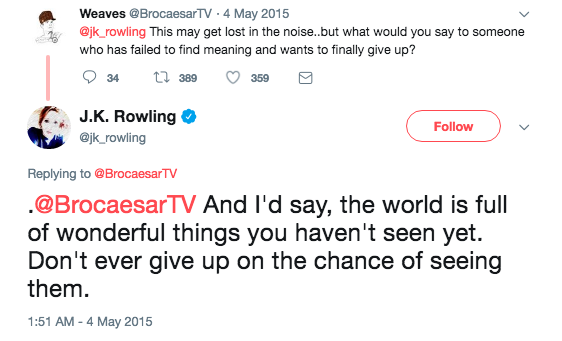 J.K. Rowling, author of the Harry Potter series, has been open about struggling with suicidal thoughts, and found relief in CBT (Cognitive Behavioral Therapy). John Hamm, the actor well-known for Mad Men, handles depression with SSRI’s and therapy. Adele struggled with postpartum depression, as did model Chrissy Teigen. Actress Emma Stone has experienced panic attacks and gone to therapy since childhood. Celebrities struggle with addiction, depression, anxiety, eating disorders – some overcome them and live healthy, happy lives. Some, sadly, don't. If you’re struggling, and not sure you can make it, I urge you to not focus in on Anthony and Kate as the only two stories out there right now. They're tragic, and they hurt to focus on. For every death by suicide, there's a story of survival, a how-to guide on living through depression, suicidal thoughts, and other mental health issues. I'm a survival story. I’m still here today, despite those nights I thought I couldn't make it. I made it through that string of suicide attempts and now have long-term recovery from addiction. I didn't fail at attempting suicide. I succeeded at continuing life. In my twenties, I never could have imagined how good my life would be today. How much more at peace I would feel, both internally and with the world and people around me. 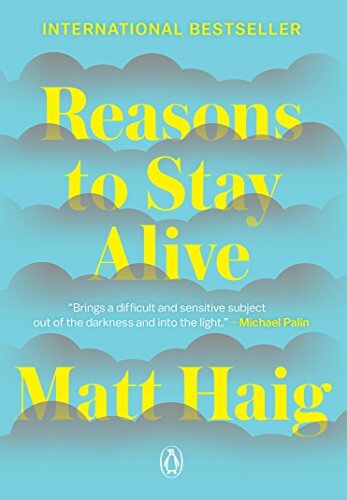 If you’re struggling, Matt Haig’s Reasons to Stay Alive is a battle cry that you, too, should succeed at continuing life. Jenny Lawson’s Furiously Happy: A Funny Book About Horrible Things will make you laugh at the insanity of being a little crazy. If you aren’t a reader, you can tune in to Kevin Hines work online. After his suicide attempt at the Golden Gate Bridge, he became a mental health advocate with a powerful message for suicide prevention. He survived, and you can too. After another shocking suicide, the message is always to reach out if you’re struggling, but reaching out just wasn’t possible for me when I was depressed. I spent nights drinking alone glued to my computer screen. If that’s you, there are now tools you can download to help, apps to keep on your phone, like Stay Alive, Calm Harm, and What’s Up Mental Health. We lost Anthony and Kate. We lost Chester. We lost Robin. We lost Whitney and Amy. But that doesn’t mean we have to lose you. And that doesn’t mean we only talk about the deaths. Because there are so many of us, celebrities and unknowns alike, still here. We are authors and busboys and runners and readers and accountants and unemployed and sales clerks and whether or not we’re deemed successful by society, we’ve overcome obstacles like mental health olympians, trying drug cocktails with patience and sticking it out through days without showers and bombing small talk with frank discussions of how we’re doing. You aren’t alone now, and you won’t be alone the next time you forget this and feel isolated again. We’re with you. If you or someone you love is considering suicide, call the national helpline 24/7 at 1-800-273-8255, or chat with them. If you are worried someone you love is considering suicide, learn how 5 steps can help you save their life.